The second largest city in New England, Worcester lost a resident to homicide this weekend, the first for 2015, according to local police. And in the days following two very different pictures of the young man, a 28-year-old father of 3 emerged from news outlets. Several news outlets have covered the story of Christian Puello-Rosado’s murder. However, we have seenreporting on Rosado’s murder in a human and respectful manner. MassLive, which is “powered” by the The Republican, who took the Respect in Reporting pledge, reported on this murder in a way that did not take away from the fact that Christian Puello-Rosado, was a human being like the rest of us. The author of the article, Scott Croteau stated the facts and reported this news that was necessary to the story. These comment have already spawned a hatred for a man that these comments do not even know, because the reporting practiced decided to focus on irrelevant information rather than the story of his murder. The comments are not even about a young father being murdered, instead commenters have already decided his life had no worth. This reporting practice also suggests that the victim deserved to be murder because of what? not being a perfect model citizen? Because he messed up a couple times in life, like we all have? 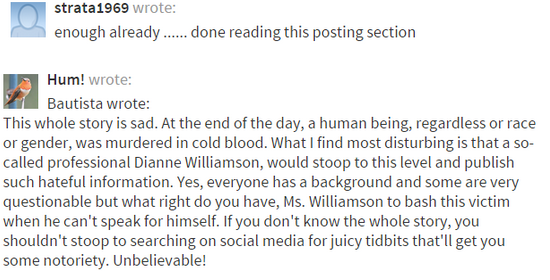 Some of her readers, however have taken to calling her out on this article. We would hope that they hold their own mission true and will revisit some of their commenting guidelines so that this kind of open hatred and dehumanizing will not take place. We hope that media sees the importance in analyzing their current reporting techniques so that this type of incident does not happen again. 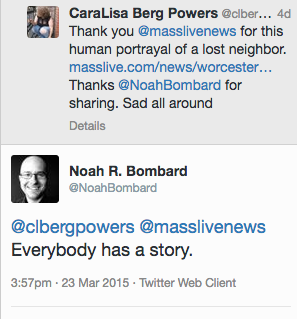 trivializing human lived is not the way to build a community and it will not make the story any better. We can all reporting the non bias news respectfully and truthfully without harming our community. It’s hard to open a newspaper or turn on the news today without hearing about violent crime and the tragic consequences. Young people in our communities often become headlines to sell papers and TV ads with little attention to their lives and the families, friends and communities they’ve left behind. With a thinning workforce of reporters, we know how difficult it can be to cover murder in low-income communities with the compassion, dignity and attention they deserve. But we also know how critical it is to do it right. When facts are missed or people are misrepresented, families, neighbors and community spend time and energy needed to grieve and move forward instead fighting to preserve the memories of their loved ones and restore their reputations. And when irrelevant information like addresses and hospitals are reported, innocent lives are put at risk. At Press Pass TV, we believe in the unlimited power of media to awaken individuals, create dialogue across race, religious and ethnic lines and empower communities to shape their own destiny. The Respect in Reporting campaign is an opportunity for news outlets to partner with communities to shape a more just and equitable future for all of the neighborhoods that they serve. In 2011, Press Pass TV worked with families that had lost young people to violence to produce a powerful multimedia exhibit called Anonymous Boston. The exhibit was not only an exploration of loss, power, media, race, poverty and violence, but a space in which the community was able to come together to explore the root causes and potential solutions to violence in our communities. One event, If it Bleeds it Leads brought local media together with community members to learn about guidelines for covering urban violence developed by the families in conjunction with journalists. These guidelines are the basis of the RIP Pledge.